It is that feeling of collectors or people with certain passions who are waiting for their goods to come. You know it should come and can't wait, you are like devouring the good once it comes, you are just an animal waiting for the prey, all the necessary senses turned on at maximum, it's a tension you try to control but it's consuming energy even when you don't think of it. And it arrives. That's the moment. Pam pam! Then you slow down. And like all the predators you enjoy the moment. You don't attack it immediately, you wait for the right time. This is how I wait for new samples or perfumes I ordered. And once they are there, like in a ritual, I do all the other things I have to do but trying. I need to know all around me is ok and all the urgent things are done, I can't mess up my trying of new scents. And I do all these in peace. And then it's the sampling. Probably it's for all of us that we have good days and bad days with these so long waited goods. They enchant us or they disappoint us. But does that matter? How a friend of mine puts it, IT'S ALL ABOUT ANTICIPATION! The most intense and charming and beautiful side of life is anticipation. Like in love, you are badly in love and you dream of all kind of things around it, they may happen or not, you may be still in love next day or not. But nothing compares with the tension and fullness and beauty of what you lived while anticipating. That tension is also the reason for violent disappointments or bursting happiness, depending how things go along with our anticipation. That's a long introduction for my latest purchases: Havana Vanilla, L'Artisan Parfumeur and Felanilla, Parfumerie Generale. I love Vanilla. Shalimar was from the first moment the most natural thing for me to wear and I never got tired of it. It seems that vanilla goes with me, people recognize the real me when I wear it. But two years ago it started the fever for perfumes and there were so many others perfumes, notes, scents to try that vanilla, so familiar to me, went in the background. Not saying that one day I read on the blog FirstNerve of wonderful Avery Gilbert that Vanilla is for nymphomaniacs. Oooo, that I didn't want to be, so I restrained myself from Vanilla, except bedroom and nightgown. These days, (except that I started wearing Shalimar by day again) I came across excited reviews of Havana Vanille and Felanilla, and couldn't stop. They came (together with Promesse d'Aubesse and Al Oudh), I tried them next day and it was my day. 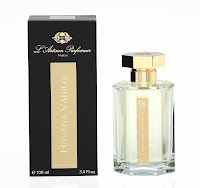 Havana Vanille, L'Artisan Parfumeur: I didn't know until recently that the flowers that we call The Queen of the Night - they are in most of the gardens in my country - are in fact Tobacco Flowers. That's something, they open only by night, and in the hot darkness they smell like paradise and intoxicating. I have never encountered this scent in perfumes and I missed it for years, since you can't find them where I live now. This is how HV opens, a strong intoxicating smell of this white flowers which alternates to me to the strong smell of cigars. And Vanilla always. Then it plays between cigars and vanilla, all the way it stays on the skin. Which it's not long. I love all the scents in it, and what it adds is the quality of most L'Artisan Parfumeur creations: it smells like a perfume. It's not only a project of bringing together some notes, it's that force which is given by a real perfume. You don't wear cigars and vanilla, you wear a perfume, which means other notes are brought in to support them in a round manner. It's gorgeous. And not forget: it's a perfect perfume for a good coffee. Probably more then cigars notes is the rum in it which goes so well with the aroma of a hot coffee. Here some advised reviews: Nowsmellthis , Perfumesmellinthings , GraindeMusc , Perfumeshrine, PerfumePosse . And others on internet if you care. Felanilla, Parfumerie Generale: long gone since I used to be scared by perfumes opening bad (I mean a bad smell, faecal or sweat or cardboard or paint or…). Felanilla opens bad to me, kind of mouldy pee whatever. Oh, it's so hard to put it in words, it's not bad like it's disgusting, it's more kind of smell of austerity in it. It's like in a severe kept cold room. And, as I've already seen pointed out by many reviewers, something of Shalimar in it. After 10 minutes starts settling and it comes out all the beauty. There is still lot of animalic, which is reach and velvety, but there are also flowers, creamy flowers and a bit of the oily feeling of old Guerlain. But also from these first 10 minutes it starts going in totally other direction then Shalimar. I won't say more about vanilla, there is just the right perfect vanilla in it, which stays as quite as a queen. Felanilla is a dream, one of the less artificial perfumes I met for long. Absolutely lovely to my nose. My only sadness is that it's not strong enough, I have to apply a lot to feel it as loud as I want. Here some advised reviews: GraindeMusc, Perfumesmellinthings, 1000fragrances, TheNonBlonde . And, of course, even more.